Reminds me of how I get pen marks all over the place. Meanwhile, Masako was shown at her house, alongside with her assistants, working hard to meet the deadline, as usual. The boy with the coloured haired was seen once again, though I still don't have his name. He seemed closer to Masako than the other assistants, but I don't know whether or not he's her boyfriend. At a later time, Daikichi commented that he surely was, but that's not really reliable narration. 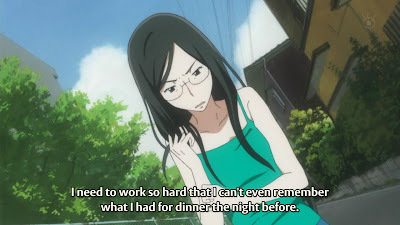 At any rate, Masako was as over-worked and stressed out as mangaka are usually depicted, but there was a curious comment from the assistant when they went to the family restaurant nearby for a break. 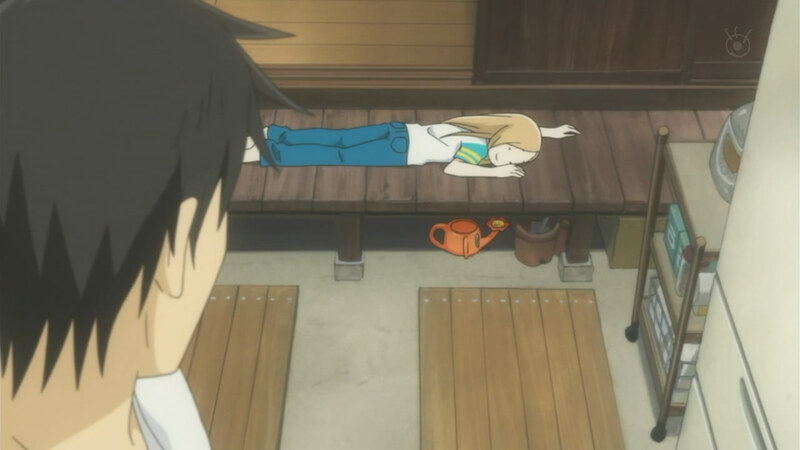 With the offer of a new job (to run concurrently with her current manga), the assistant commented that she already made enough money to put food on her plate, and that she shouldn't get greedy and pursue more. Given their closeness, I surmise that Masako is thinking about the money, but why? Personalized touches are always best. On the day of the visit to the grandfather's grave, Rin realized that she had gone there frequently in the past. With Daikichi accidentally letting it slip that they had probably been visiting his grandmother and that his mother was the child of that union, Rin actually put things together to realize that she was Daikichi's mother's sister. However, the arrival at the grave put aside Daikichi's fears of Rin understanding their strange relation - at least, for the time being. (I'd love to see this explored later!) 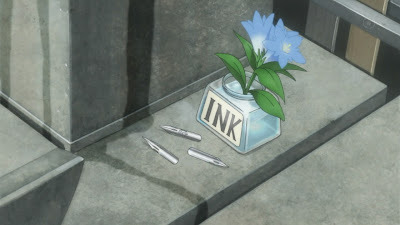 Seeing that the grave had already been slightly cleaned, and some bellflowers in an empty ink bottle had been left, Daikichi figured out that Masako had been there and ran off to find her (leaving Rin to pull out weeds at the grave). It's quite obvious that, despite it all, he's generally still worried that Masako will come to take Rin away. He did give her the option of secretly seeing Rin, because he wouldn't allow a meeting unless the little girl wanted it, and then ran back. Wow. That's actually working really hard. 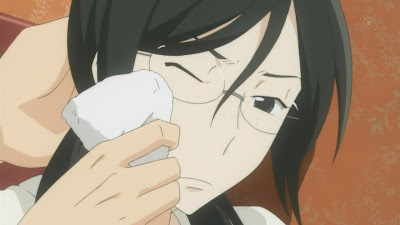 Masako was quite clearly overcome with emotion as she watched Rin (along with the assistant, whom she had accompany her). These scenes made it pretty clear that she felt a lot of regret for her past actions, and that she was looking for a way to atone. Perhaps she wanted to find it through working herself to death? She did comment that, since she had given up Rin for work, she should be working much harder. However, if the assistant's words are to be believed, then Masako is actually looking for the money, not something to take her mind off things. In that case, why does she need so much money? 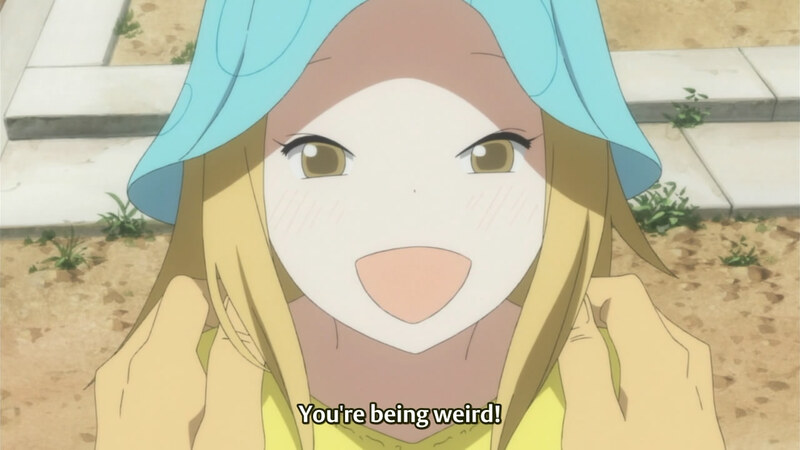 I wonder if she actually plans to take Rin back. By her previous interactions with Daikichi, it was initially clear that she didn't think like that, but she's proven to be emotionally unstable in her decisions (especially with her fluctuating regret). With only 3 more episodes to go, I don't know if the goal is to have some kind of climax or retain the usual pacing. While I don't think that Masako wants to take Rin back, I do wonder if she plans on doing something "as a mother". 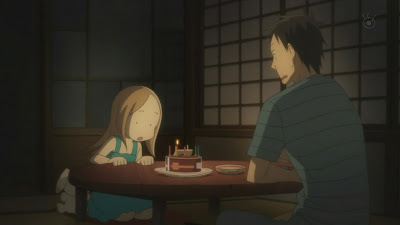 Rin's "birthday party" was simply her and Daikichi, and a chocolate cake. She turned 7, which signified that even more time had passed since the two had met. I don't know if she's grown even more mature since that time, but it was touching to see how well she handled the changes at the grandfather's house. My previous questions were answered: Daikichi's maternal uncle was in possession of the house, although no one lived there. The flowers in the garden had been pulled out - not out of malice, but rather because they had withered from lack of tending (and due to winter). The grass and dirt had been replaced with stones, to ensure that the yard wasn't overrun with weeds. I had actually expected Rin to be far sadder upon learning of the changes, since her emotions would be fully justifiable, but she calmed herself by commenting that they had planted bellflowers at Daikichi's house, anyway. I have to admit that even I was sad at the changes; the natural flow of time just frightens me. Damn. 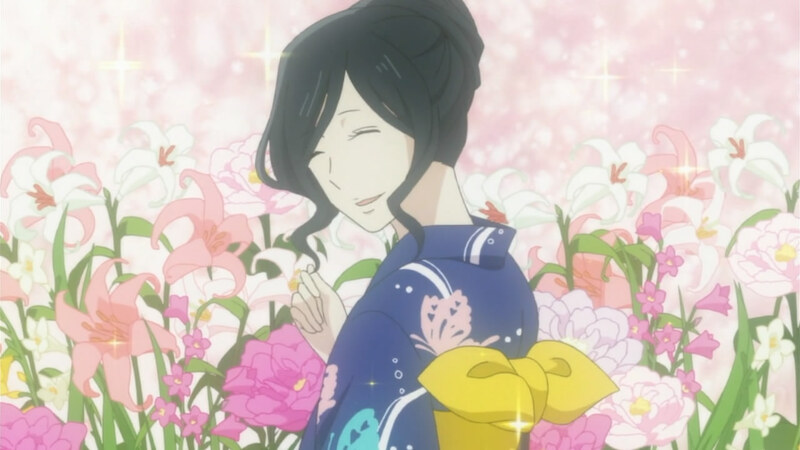 Kouki's mother is pretty. By the end of this episode, I was glad that some of my questions were answered (such as who takes care of the old house, for one thing). I'm surprised that I've come to blame Masako less for her actions; it's the aftermath that matters more, in the long run. I'm still enjoying the fact that the episodes largely focus on Rin and Daikichi, together, although it was nice to know more about Masako.